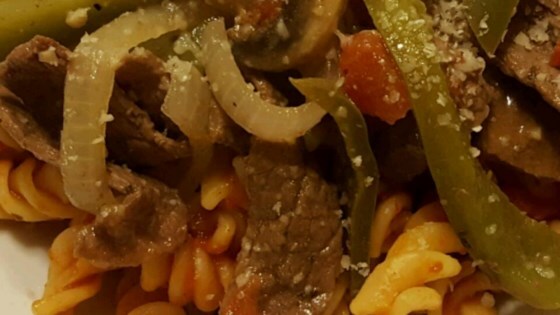 "Pasta mixed with peppers, steak chunks, mushrooms, onions and tomato, topped with a sauce of your choice!" Heat oil in a large skillet over medium heat. Saute steak strips for 10 minutes. Stir in green and red bell pepper, mushrooms, tomato and onion. Cook for 10 minutes, or until vegetables are tender. Serve over pasta. Not much flavor and it seems that steak and pasta should not go together. Def had to season this a lot. Served with whole grain pasta. Pretty tasty!